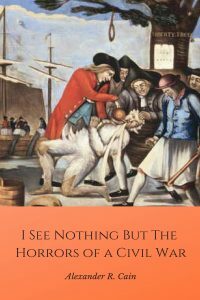 In 2014, Author Alexander Cain released the first edition of “I See Nothing But the Horrors of a Civil War.” Now, five years later, this acclaimed book has been rewritten to reflect the recent discovery of countless new historical documents, town records and historical artifacts. For the first time Cain carefully outlines the political, social, religious and economic motivations to remain faithful to the Crown. I See Nothing But the Horrors of a Civil war also reconstructs the role of the American loyalist who served with McAlpin’s Corps of American Volunteers during the Burgoyne Invasion. Finally, the role of loyalist refugees is brought to light. Cain carefully recounts the daily struggles of female loyalists, as well as the hardships experienced by exiled loyalists who were forcibly confined to Canadian refugee camps. This book is free from 04/09/2019 until 04/13/2019. Alexander Cain graduated from Merrimack College in 1993 with a degree in economics and New England School of Law with a juris doctrate. He frequently lectures on constitutional, criminal and historical issues and developments in the United States. He is one of the founding partners of Untapped History, a historical walking tour company based in Newburyport, Massachusetts. Alex has published several research articles relevant to New England militias and loyalists during the American Revolution. He has published two books – "We Stood Our Ground" and "I See Nothing but the Horrors of a Civil War". Alex resides in Massachusetts with his wife, Paula, and his children John and Abigail.